There's some strong speculation suggesting that LG and Google are planning to launch two new smartwatches on February 9 to celebrate the arrival of Android Wear 2.0, and we've now got a clear look at one of them, the LG Watch Style. The hi-res pictures come courtesy of renowned tipser Evan Blass (@evleaks), who posted two shots of the smartwatch today in silver and rose gold colors. It looks like LG got the styling right, no matter what the battery life and performance are like - these are two fine-looking wearables. 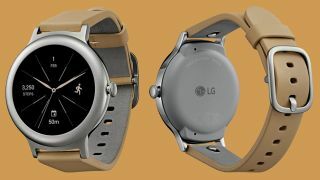 As yet there's no hi-res shot of the other model, the LG Watch Sport, but we have seen a rather blurred image of this one as well. It's a little more rugged looking and would appear to be aimed at outdoor enthusiasts. With so many leaks about the devices, and now these pictures from such a reputable source, it's a safe bet that we know what's on the way even before LG announces anything. The Android Wear 2.0 launch date was previously leaked by Evan Blass too. Under the (tiny) hood, the LG Watch Sport is said to be powered by 768MB of RAM, 4GB of internal storage and a 430mAh battery. It's going to boast a heart-rate sensor, 3G/LTE connectivity and a 1.38-inch, 480 x 480 pixel OLED screen, and will be 14.2mm thick and waterproof, apparently. The LG Watch Style will be thinner and smaller, at 10.8mm thick with a 1.2-inch, 360 x 260 pixel screen, 512MB of RAM and a 240mAh battery. The 4GB of storage matches the Sport but it's only going to be water resistant rather than waterproof.